The Brown Pelican remains one of the most iconic marine, avian species. They are known for their large migrating flocks and their decline due to human encroachment. In 1903 a U.S National Wildlife Refuge was established to help increase populations off the coast of California. The refuge proved futile when hunting and DDT (a pesticide) decreased their once abundant populations. DDT was used as an insecticide but contributed to the pelican’s endangerment via direct toxicity and impaired reproduction. In 1970, the Brown Pelican was red-listed as an endangered species. Rachel Carson’s book “Silent Spring” sent out a wave of hope that lead to the ban of DDT. This was a major win for the Brown Pelican population and led to its removal from the Endangered Species Act (ESA) in 2009. Once again thousands of Brown Pelicans could be seen soaring off the coasts of California and Mexico, in nesting colonies or migrating across the U.S. (Williams, 2014). Six years after being delisted, their large numbers could no longer be sustained. The ESA focused on chemical pollution restrictions but ignored other factors that could affect pelican populations when planning their recovery. Overfishing and human impacts on their habitat are much larger issues now than they were 1970. This has left them with little food and the inability to self-sustain their population. Pacific sardines, their main food source disappeared due to high commercial demand for omega-3 (Williams, 2014). Then, in 2010, the Deepwater Horizon oil spill was one of the most widely known disasters to hit the species. Sadly, 58% of the species killed by the oil spill were these birds (Moosavi, 2011). This slow decline will likely lead to the Brown Pelican being re-listed. 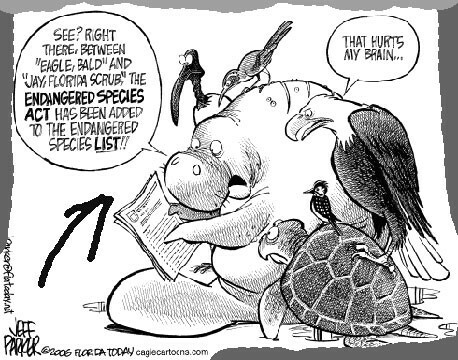 Human activities are the number one cause of endangered and threatened species. The Brown Pelican is one of thousands that are negatively affected by humans. Thus, it is our responsibility to ensure proper protection and limit mistakes when delisting a species (Williams, 2014). The growing threat towards species and loss of biodiversity worldwide prompted the need for effective conservation efforts. Thus, the Endangered Species Act (ESA) was established in 1973. Its purpose was meant to protect and recover endangered or threatened species and the ecosystems they rely on. It is administered by the U.S Fish and Wildlife Service and the National Marine Fisheries Service (NMFS) of the Department of Commerce. Under the ESA, species may be listed as either endangered or threatened. If a species is listed as “endangered” it means it is in danger of extinction throughout all or a significant portion of its range. “Threatened” indicates a species is likely to become endangered within the foreseeable future (Endangered Species Act, 1973). When a species is taken off the endangered list it should signify that they have fully recovered and do not require protection. Over 2,000 species are listed as in danger of extinction. All of these species have a recovery plan (Seaholes, 2007). Out of those species the U.S. Fish and Wildlife Service officially claims that 46 have been delisted. Unfortunately, only 19 of the delists were due to recovery, 17 were due to data error, 9 due to extinction and one due to partial recovery/data error (Doak et al., 2015). This indicates that the ESA’s approach to recovery was not successful and certain aspects were overlooked. The necessity of effective recovery plans and proper implementation comes from both social and environmental problems. Loss of habitat is a huge reason why so many species are threatened or endangered and prevents them from ever effectively recovering. Habitat loss comes from an increase in urbanization, farming, deforestation, and many other human related developments. These developments cause species to be unable to reproduce and decreases overall survival (Kearney, 2013). Effective and detailed recovery plans must be implemented in order to combat these constant developments. The Brown Pelican’s decline after its delisting is one example that indicates the ESA recovery plans are not adequate. Revision and aid are needed to ensure that once a species is delisted it will not render a population decline. The problem lies within unclear language associated with recovery methods and poor incentives for landowners to adhere to recovery plans. The Endangered Species Act has significant flaws with species recovery protocols that can be fixed through better wording of act provisions and incentives for landowners. Life is a complex interwoven web in which one thing affects many others. In Europe over the last 21,000 years, over 50% of mammalian species have gone extinct from habitat destruction and temperature changes strongly linked to human impacts (Varela et al., 2015). We are currently in the midst of our 6th mass extinction. Human\ involvement in global warming, invasive species and habitat loss are the main causes of the high extinction rates. Species diversity ensures ecosystem resilience; giving ecological communities the scope they need to withstand stress. By allowing species to go extinct we risk throwing off the ecosystem or eliminating something that could be useful to us (Varela et al., 2015). An animal or plant’s DNA sequence could be the cure to cancer or other diseases without us knowing, and when that species goes extinct the cure goes along with it. For example, the Papaver somniferum, or better known as the opium poppy is a vital plant. Think of how different medicine would be if this plant had gone extinct and morphine, a drug heavily relied upon in hospitals, had never been discovered (“History”, 2015). John Muir, a famous naturalist and conservationist, stated it perfectly when he said “When we try to pick out anything by itself, we find it hitched to everything else in the universe” (Wood, 2015). While some people will argue that it is just one plant or animal species and who cares what happens to it, it is important to remember that every species, no matter how small, can have a big ripple effect. Proper biological conservation requires communication from biologists, educators, citizens, policy makers, and government officials. Differences in jargon, data gaps and goals prove to be a huge obstacle for achieving effective results. Today, more than 40 years after the Endangered Species Act was written, it is still unclear as to how to recognize a species for protection as well as a clear definition of what a “species” is. Species concepts remaining unclear allow for stakeholders to defend certain definitions that benefit their own agenda rather than the species at hand (George & Mayden, 2001). The terms endangered and threatened are defined in risk factors such as “in danger”, “likely to become endangered” and “reduce appreciably the likelihood of both survival and recovery”(Endangered Species Act, 1973). These definitions may lead to a inconsistency of understanding because they do not define exact thresholds to compare extinction rate estimates (Woods & Morey, 2008). The vague and unclear language leads to misperceptions regarding the recovery of a species, where the risk level is determined on a case by case basis that leads to confusion and unevenness. Data errors are an outcome of this poor understanding of the ESA’s recovery list requirements. A widely consistent census on definitions and requirements of the recovery of a species will decrease the margin of error and thus data errors that can result in false delisting. The total fines can be upwards of $100,000 and jail time of a year for harming a species. The ESA often regulates land or takes land away with minimal compensation. This can lead to landowners eradicating species and suitable habitat from their property rather than deal with ESA regulations. Landowners have begun a process known as preemptive habitat destruction. Once they find out that their land has potential to be a site for endangered species they prematurely destroy that habitat before it becomes suitable. Jeffrey Michael (2000) uses the example of the red-cockaded woodpecker (RCW). A study revealed that “by preventing the establishment of an old growth pine stand, landowners can insure that RCWs do not inhabit their land and avoid ESA regulations that limit or prohibit timber harvest activity” (Michael, 2000, 32). Rather than deal with the ESA, landowners would rather circumvent the issue altogether. They see it as the government taking away their land and their livelihood, which is what makes them one of the biggest opposers to the ESA. When landowners make their property inhospitable to species or refuse to allow government biologists to survey their land, it results in a poor conservation record (Micheal, 2000). Species recovery is dependent on having the space to actually recover. Private land makes up 60% of the United States and 80% of endangered and threatened species habitat is on private owned land (Rae, 2004). If landowners are not willing to give up land that is deemed suitable or give access to their land through cooperation with government officials, it will be very difficult to save certain species. Changes to the act need to be established to ensure cooperation between private landowners and ESA officials. As with many government generated acts there are numerous oppositions to them; the Endangered Species Act is no exception. Many people complain that the act spends more money that it is worth. John R. Platt (2013) discusses in his news article that in 2012 the “U.S. federal and state governments spent just more than $1.7 billion to conserve endangered and threatened species under the Endangered Species Act” (Para. 8). Many people would argue that this money could go to better use, such as national infrastructure or education. While funding those efforts is worthwhile and important, so is saving endangered species. One benefit of revising the ESA so that recovery plans are more effective is that the money budgeted to the act would be used more efficiently and cost effectively. If species are being delisted at a faster rate and in such a way that they are not going to be immediately placed back on the list, the ESA could be using its budget in such a way that it does not spend money needlessly. Looking at this number a different way shows that “the U.S. human population stood at 314, 542,177 at the end of FY 2012, according to the U.S. Census Bureau. The ESA expenditure of $1.7 billion translates to just $5.40 per person” (Pratt, 2013, para. 8). When looked at in this way, the budget does not seem to cost taxpayers all that much. Implementing a successful and practical plan to ensure ESA’s productivity is important to decrease the likelihood of re-listing a species. First, we suggest that the recovery methods and guidelines be reviewed and modified, to ensure a clear guidance to all those managing procedures. This is important to guarantee that mistakes and data errors are lessened. A universal definition of a “species” and a viable, “self-sustaining habitat” must be created to avoid any jargon (Doak et al., 2015). In addition, more specific titles can be given to species in addition to endangered or threatened. For example, the Scientific Committee on the Status of Endangered Wildlife in Canada (COSEWIC) which is a part of the Species at Risk Act (SARA) lists species as: extinct, extirpated (no longer existing in the wild in Canada, but is still present in other parts of the world), endangered, threatened, or vulnerable (a species partially at risk, but not yet threatened)(Species at Risk Act, 2002). Having more specific titles for the species allows for clearer understanding of where these species currently stand. If the ESA was revised to include something similar, less species could be lost due to data error and misconceptions. To further make recovery plans effective, they should account for risk factors for common problems associated with threatened species such as habitat loss, natural disasters, depletion of resources, climate change, etc. A defensible plan should include quantitative recovery criteria that state a species is safe from extinction as well as any extreme declines in the future. These criteria will account for any potential or future risks, such as BP oil spill effect on brown pelican populations. This will ensure that a species will still play its ecological role and will be self-sustaining. Having risk factors already integrated will make recovery plans more adaptable to changing environments. Research on assessing extinction risk indicates a population viability analysis can quantitate whether a species population is able to meet a certain standard. This tool can be used to judge the likelihood of tolerating any population decline while being self-sustaining (Doak et al., 2015, p. 190). Secondly, a major roadblock comes from hesitant landowners. Implementation of modest incentives for landowners will help conserve species rather than cause the abandonment of land. Habitat loss and fragmentation remain the most concerning aspect of threatened and endangered species. The ESA penalizing private landowners with undeveloped habitat of endangered species is retroactive and can work against conservation. For proper success landowners must be cooperative and benefit from conservation initiatives. Revising the ESA so that it better supports landowners in these situations will help increase the recovery of many species. Not only can better incentives be created, but also stripping the ESA of its land use controls will help encourage cooperation from private landowners. This does not mean there are no land use controls, but rather someone outside the ESA handles them. Some Southern African countries have moved away from land use control by large government officials and rather given it to local governments and private landowners (Seaholes, 2007). This has led to private landowners receiving incentives from conserving endangered species and better cooperation with the official’s requests because they have more input about the process of recovery. Implementing something similar with regards to the ESA could help create better relations with landowners and therefore generate the space needed for recovery efforts. The Endangered Species Act was created as a means to help prevent the extinction of plant and animal species that were suffering for one reason or another. It was not only meant as a way to save species, but to help the human race too. The planet is an extremely interwoven web where one thing inevitably connects to another. The loss of one plant or animal species may not have immediate repercussions, but could be devastating in the future. The ESA was meant to protect endangered species by putting them on a list, helping their population numbers recover, and then delisting them when they were once again able to sustain themselves. Instead, numerous species have been put on the list with a small chance of recovery. The number of species delisted from the ESA is extremely low, and landowners who once may have supported these efforts do their best to steer clear of all things related to it. While it has its flaws the ESA is an important and necessary piece of legislation. Two major problems that are counterproductive towards species recovery are poor universal understanding of definitions and rules regarding delisting a species and lack of incentives for landowners. Rather than scrap a document that has the potential to save countless endangered species, certain revisions could significantly help recovery efforts. To better relations with landowners better incentives need to be implemented. Working with them, rather than them working against the act, would dramatically increase recovery efforts. Better economic compensation and an adjustment of who dictates land use controls would help landowners be encouraged to embrace endangered species rather than shy away from them. Many of the problems that are causing a loss in species biodiversity are linked to humans such as increasing pollution, consumption and population. While saving species close to extinction may not be a top priority it should not be shoved under the rug. It is our responsibility to help save those species that we are causing to suffer. While there are a multitude of problems that could be fixed with regards to the Endangered Species Act, one place to start is better recovery efforts. US Endangered Species Act. BioScience, 65(2) p. 189. Endangered Species Act of 1973. 16 U.S.C. 1531-1544. (1973). History: The origins of opium. (2015). Retrieved from: http://www.deamuseum.org/ccp/ opium / history.html. Kearney, M.,R. (2013). Activity restriction and the mechanistic basis for extinctions under climate warming. Ecology Letters, 16(12), 1470-1479. Michael, J. A., (2000). The Endangered Species Act and private landowner incentives. (2000). Human Conflicts with Wildlife: Economic Considerations, 29-35. Isle, Louisiana. American Geosciences Institute, 43(3), 11. Pratt, J. R. (2013). How much did the U.S. spend on the endangered species act in 2012?. Rae, J. (2004). Our Endangered Species Program and How It Works with Landowners. U. S.
Species Act and How to Fix It. Natural center for Policy Analysis, 303-310.
extinctions. Global Change Biology, 21(4), 1475-1481.